Halloween is on the horizon! 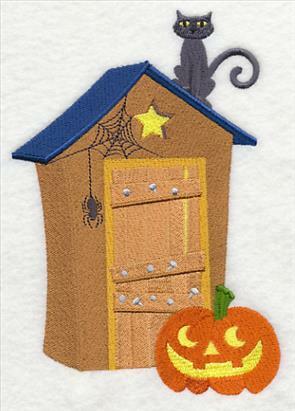 It's time to turn our homes into haunted houses, and decorate for all the ghosts and goblins that will come to our door. 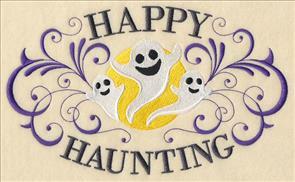 New designs add a hauntingly beautiful note to costumes, garments, and home decor. 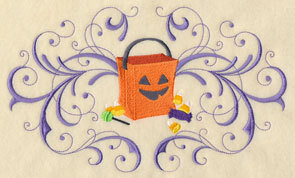 Stitch spooky bouquets, retro-style bunting, and colorful motifs for totes and trick-or-treat bags. Scroll down the page and see the variety in these new designs! 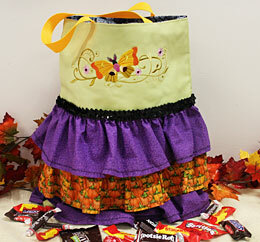 This ruffled tote bag is the perfect addition to any costume or ensemble. We decked it out in Halloween designs. 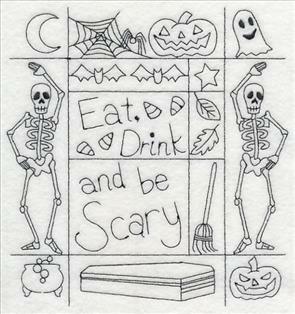 You can adapt it for other seasons and holidays, too! 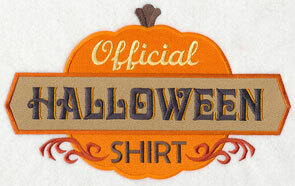 The spirit of Halloween glows bright in this design! 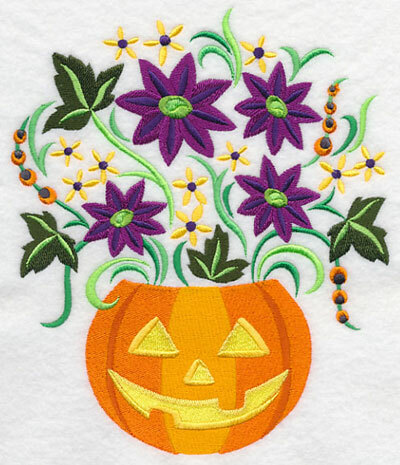 Creepy, colorful flowers bloom from a jack-o-lantern. 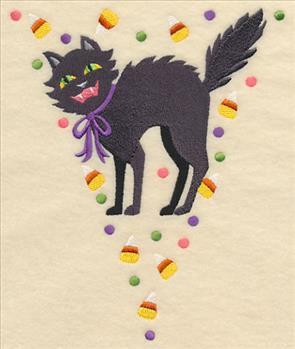 It's an excellent addition to candy bags and centerpieces of Halloween-themed wall hangings. 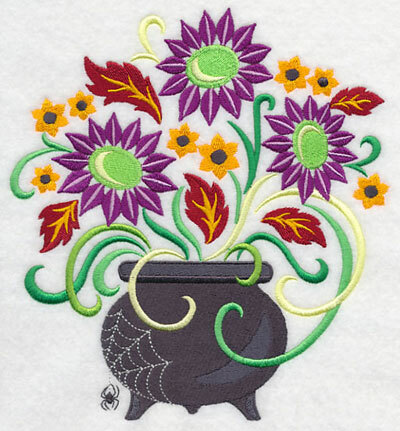 6.65" x 7.78" and 5.82" x 6.81" and 4.86" x 5.69"
Spooky purple and green flowers wind their way from this haunted cauldron. 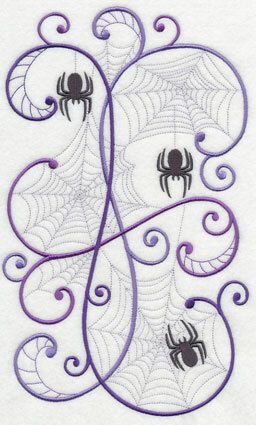 The spider and web on the lower left are an extra-creepy touch. 6.88" x 7.39" and 5.84" x 6.26" and 4.87" x 5.23"
7.79" x 7.77" and 6.89" x 6.87" and 5.89" x 5.87" and 4.89" x 4.87" and 3.89" x 3.88"
These designs are colorful and eye-catching additions to tote bags. 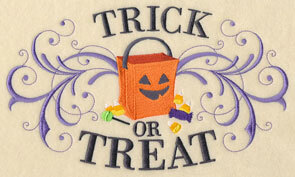 You might be handing out candy, or making trick-or-treat bags for little ones. These designs are excellent features on the bags! 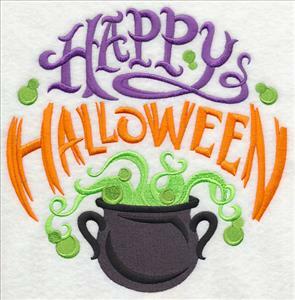 7.78" x 7.75" and 6.92" x 6.89" and 5.88" x 5.85" and 4.88" x 4.86" and 3.88" x 3.86"
Will you be dressing up for the office on Halloween? 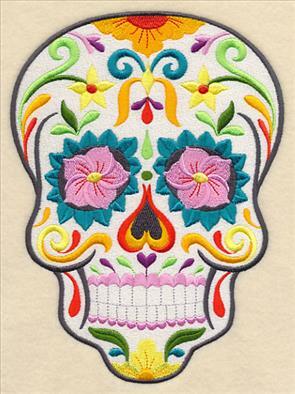 Stitch these colorful designs onto sweatshirts for a frightfully festive look! Use one piece of cutaway stabilizer on the back of the sweatshirt. 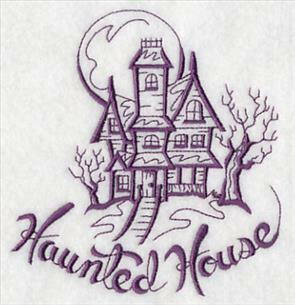 That will keep the stitches looking crisp and new, wash after wash.
7.74" x 7.78" and 6.87" x 6.91" and 5.85" x 5.89" and 4.85" x 4.89" and 3.85" x 3.88"
Haunted (out)houses are clever and fun additions to bath towels. Spiders dangle from the doors, and jack-o-lanterns give their biggest grins. 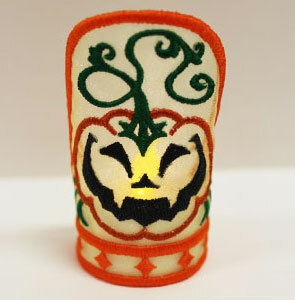 4.75" x 6.84" and 2.61" x 3.87"
Children of all ages love Halloween. There's something so exciting about dressing up as our favorite characters, or the classic choices of witches, skeletons, ghosts, and goblins. Below you'll find a sweet group of kiddos that are all dressed up for the big night. 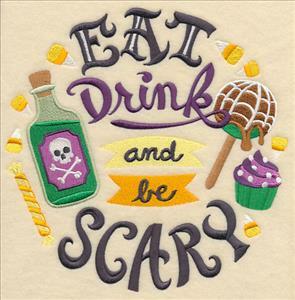 They're not-so-scary additions to quilt blocks, tea towels, and placemats for Halloween parties. 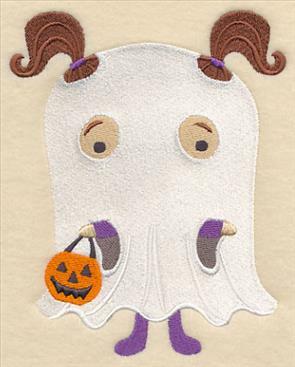 4.84" x 6.44" and 2.89" x 3.86"
A little girl's pigtails peek through her ghost costume. And, young Jack-o-Lantern on the right is ready for his candy! 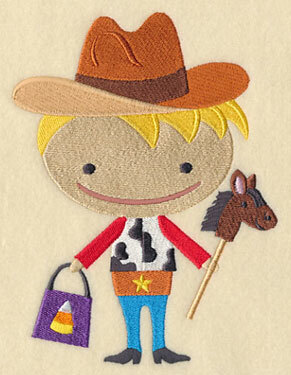 4.84" x 6.75" and 2.76" x 3.85"
A little cowpoke and young mummy are all dressed up for Halloween. 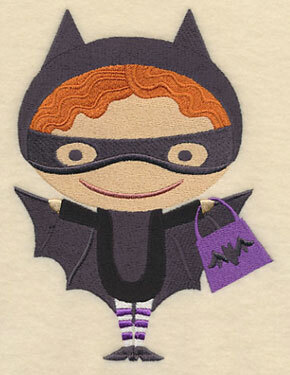 They're adorable on little trick-or-treat bags, capes, and shirtfronts. 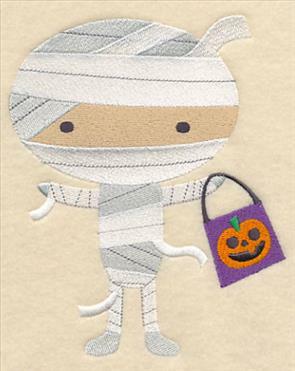 4.86" x 5.93" and 3.16" x 3.85"
Children's Halloween costumes let their creativity shine. 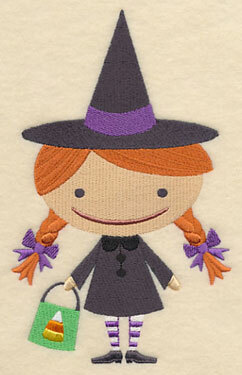 This little witch and kitty-cat all dressed up and ready to go! 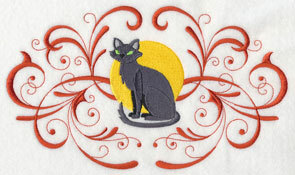 They're charming additions to shirts, bath towels, kitchen towels, placemats, and table runners. 4.85" x 5.80" and 3.22" x 3.86"
A little vampire, complete with a curl across his forehead! His trick-or-treat bag with bat is an extra-clever touch. 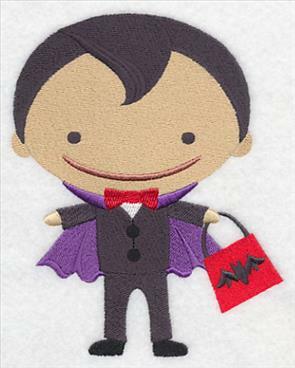 Stitch this adorable Dracula on quilt blocks, shirt fronts, tote bags, and more. 4.85" x 6.00" and 3.11" x 3.85"
Order the designs individually by clicking the links above, or get the whole gang of 9 in a design pack! 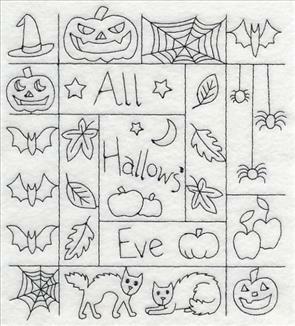 Stitch them onto sweatshirts, trick-or-treat totes, quilt blocks, and more. 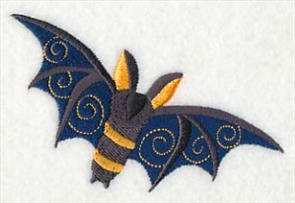 Legends of vampires and Dracula have been passed down from generation to generation, and bats have emerged has a classic symbol of Halloween. 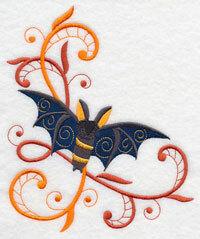 These designs feature elegant and graceful bats, flying against dramatic filigree whirls and swirls. 6.89" x 10.77" and 5.86" x 9.16"
5.98" x 11.74" and 4.78" x 9.39"
3.97" x 7.79" and 3.50" x 6.86"
Border and corner designs are fashionably frightful ways to dress up placemats, table runners, and linen napkins. 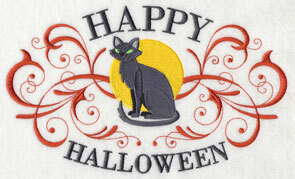 Add this haunting couture to your Halloween party! 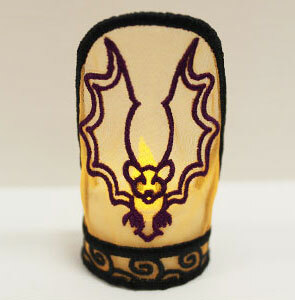 11.74" x 3.79" and 9.39" x 3.03"
5.86" x 6.71" and 4.82" x 5.51"
These bats have delicate filigree tucked into their wings. 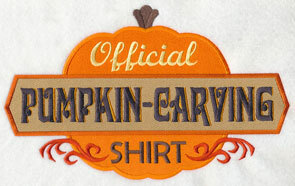 Use in conjunction with the designs above, or as logos on seasonal polo shirts! 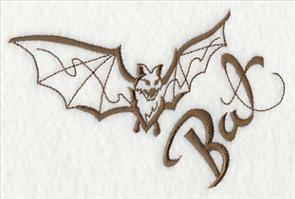 3.86" x 2.27" and 2.49" x 1.48"
The boo-tiful bat designs are sold singly; use the links above. Or, get them in a design pack! Four sizes are available to suit a variety of project ideas. 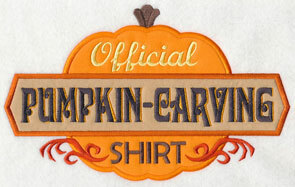 Add them to sweatshirts, quilts, and table linens, for a festive and traditional look. Click on a link to a pack to see the designs that are included in each pack, and add it to your cart! 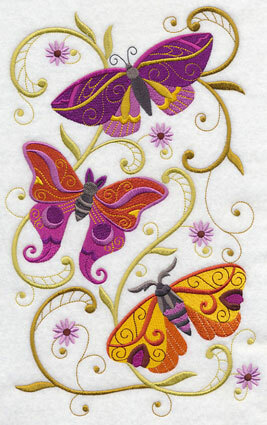 **XL - 12 designs smaller than 7" x 11.8"
**Lg - 12 designs smaller than 6" x 10"
**Md - 11 designs smaller than 7.9" x 7.9"
**Sm - 9 designs smaller than 5" x 7"
Colorful moths flutter and flit against elegant filigree and delicate flowers. 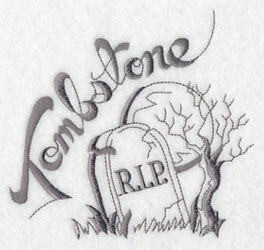 These designs will add a hauntingly beautiful element to your garments and decor items. 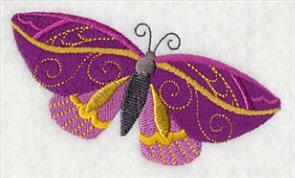 We stitched the samples in a contemporary palette of purple, orange and gold. Experiment with other color palettes to match your preference and taste! 6.88" x 11.24" and 5.74" x 9.39"
5.46" x 11.73" and 4.38" x 9.39"
3.63" x 7.79" and 3.20" x 6.86"
These moths have interesting lines, and unique markings. 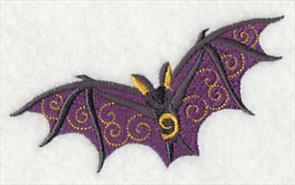 Against a background of filigree and flowers, they add an elegant and non-traditional effect to Halloween garments and decor. 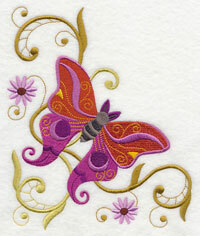 11.75" x 3.66" and 9.40" x 2.93"
The moths are also available without a filigree background. Use them in conjunction with the designs above, or in other projects. 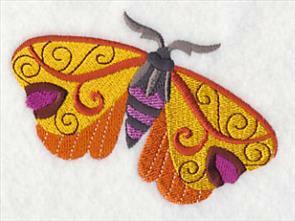 3.87" x 3.78" and 2.50" x 2.44"
These small moths add a delightful look to the corners of placemats and linen napkins. Change colors to coordinate with your home decor and personal taste. 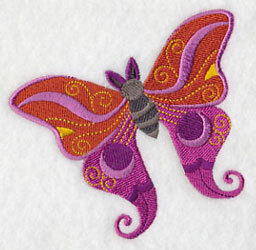 3.86" x 2.34" and 2.49" x 1.51"
Attract the single moth designs to your basket by clicking the links above. Or, get them all in a design pack! 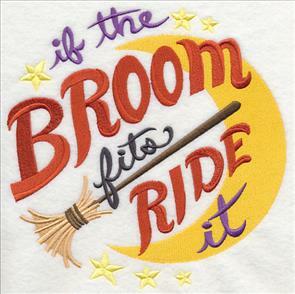 Four sizes are available to suit a variety of projects: shirts, capes, wall hangings, pillow covers, placemats, and totes. Click on a link below to see the designs included in the pack, and add it to your cart. **XL - 16 designs smaller than 7" x 11.8"
**Lg - 16 designs smaller than 6" x 10"
**Md - 15 designs smaller than 7.9" x 7.9"
**Sm - 13 designs smaller than 5" x 7"
Delicate cobwebs stitch across sleek filigree swirls. Spiders hang, ready to pounce on their prey! 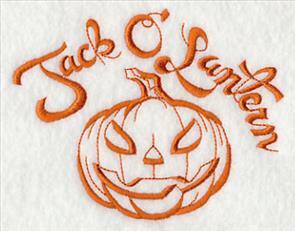 Add these designs to sweatshirts and table runners for a classic Halloween theme. 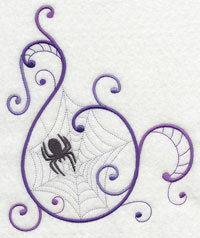 The stitches for the cobwebs are light and thin, so these designs will work best on flat, smooth fabrics. 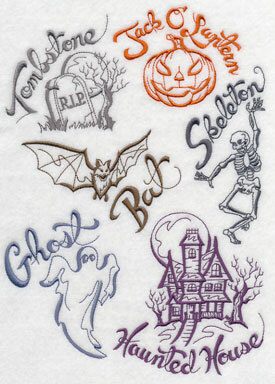 6.90" x 11.38" and 5.71" x 9.40"
6.38" x 11.75" and 5.11" x 9.41"
4.24" x 7.80" and 3.73" x 6.85"
Add a spooky look to dining decor with these designs! 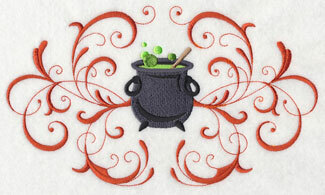 Stitch the border on placemats or table runners, and the corner on linen napkins. 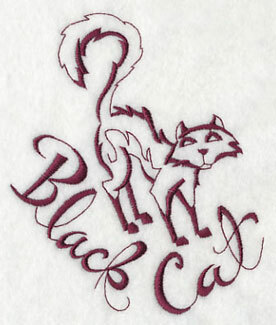 11.75" x 4.50" and 9.40" x 3.61"
5.86" x 7.00" and 4.84" x 5.78"
Add this design to the left chest of a polo shirt as a fashionable and frightful logo! 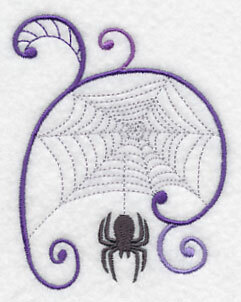 3.04" x 3.86" and 1.97" x 2.50"
Add the elegant, delicate filigree webs to your Halloween costumes, projects, garments, and decor. 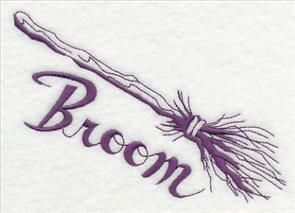 The designs can be ordered individually by clicking the links above. Or, buy them all in a design pack! Four sizes are available to suit a variety of projects. Click on a link below to see the designs included in the pack, and add the pack to your cart! 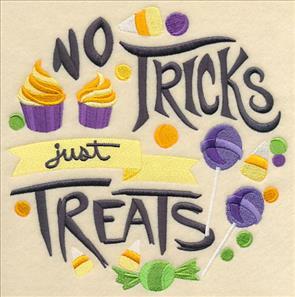 **XL - 10 designs smaller than 7" x 11.8"
**Lg - 10 designs smaller than 6" x 10"
**Md - 9 designs smaller than 7.9" x 7.9"
**Sm - 7 designs smaller than 5" x 7"
Dress up a set of dishtowels with these clever, crafty designs! 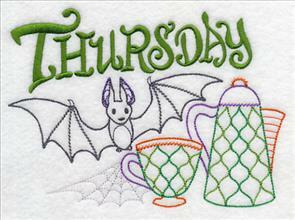 Spiders and webs adorn teapots and cups. The combination of "classic" and "creepy" is delightful! 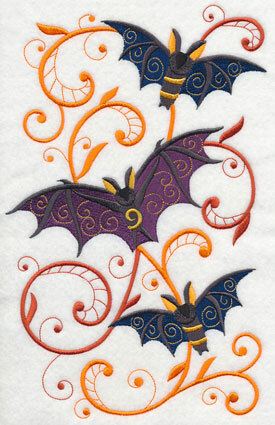 6.83" x 4.33" and 3.86" x 2.45"
Bats and cats perch and prowl in these colorful designs. 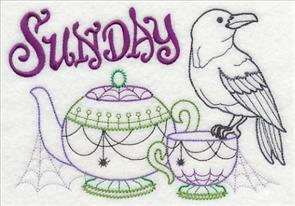 Unique stitch types are reminiscent of hand embroidery - but you get the precision and speed of your embroidery machine. The "day of the week" text is on a separate color stop, so you can delete it (or skip it) if you wish, and use the designs without the words. 6.90" x 4.70" and 3.89" x 2.64"
We use towels from Kohl's, Target, TJ Maxx, and Home Goods. Sometimes you can find sturdy towels at Michael's. 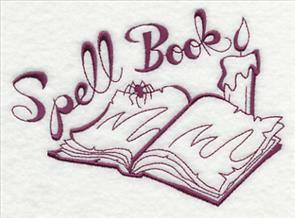 Online sources include Amazon, The Sewphisticated Stitcher, and All About Blanks. 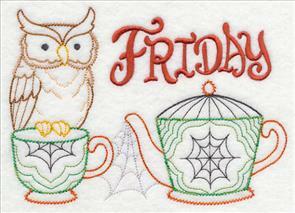 And, Aunt Martha's brand (found at JoAnn's website) is a favorite, too. 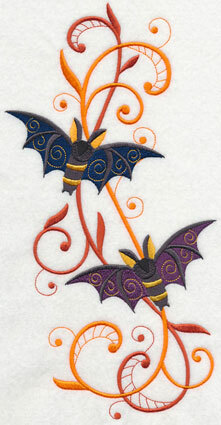 6.75" x 4.87" and 3.80" x 2.75"
These designs are reminiscent of hand embroidered towels from the '40s and '50s. But the creepy birds, bats, cats, and spiders make them ironic (and, hopefully, iconic!). 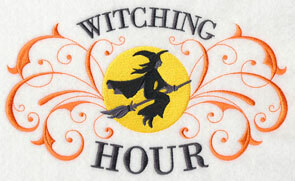 A set of these dishtowels is a fun way to decorate your kitchen for the witching season. 6.78" x 4.84" and 3.86" x 2.77"
Crafty, and so clever! 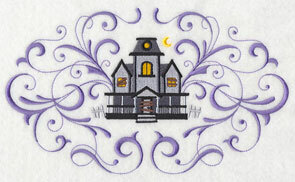 All the ghosts and goblins that visit your kitchen will love seeing towels embroidered with these designs. Two sizes are available. Click on a link below to the size that you'd like, and add the pack to your cart! Bring beauty and elegance to your garments and home decor with these designs. 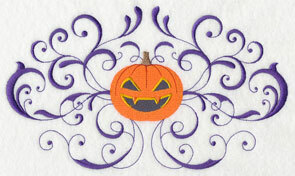 A grinning jack-o-lantern is paired with a filigree background. The result is oh-so-graceful! Designs are available with and without text for your project needs. 9.41" x 5.53" and 7.81" x 4.59"
9.41" x 5.52" and 7.81" x 4.58"
6.82" x 4.00" and 3.86" x 2.27"
Chefs, cooks, and bartenders will love shirts and aprons embroidered with a bubbling cauldron and witch's (or witches') brew text. 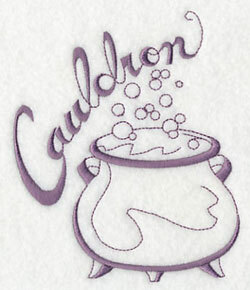 9.41" x 5.54" and 7.81" x 4.59"
6.87" x 4.05" and 3.86" x 2.29"
The bubbling cauldron is also available without text. The shape of this design is a pleasing fit for shirt fronts, apron fronts, and rectangular placemats. 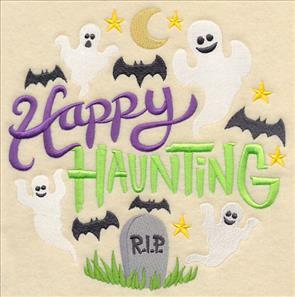 9.41" x 5.46" and 7.81" x 4.53" and 6.87" x 3.98" and 3.86" x 2.24"
A trio of grinning ghosts fly out of a full moon, framed in elegant filigree! 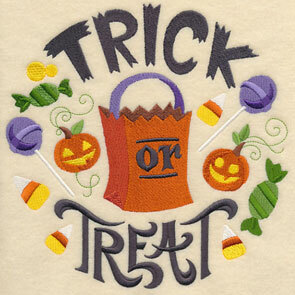 Fashionable and fun on shirt fronts and trick-or-treat bags. 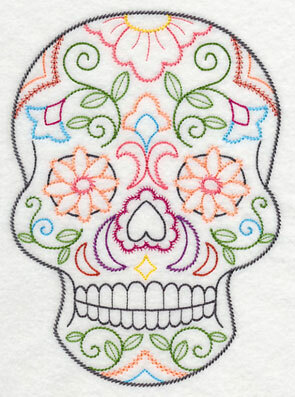 This is also beautiful on linen kitchen towels and tea towels. 9.41" x 5.64" and 7.81" x 4.68"
9.41" x 5.62" and 7.81" x 4.66"
6.84" x 4.08" and 3.86" x 2.31"
A witch's silhouette against a full moon is a classic symbol of Halloween. 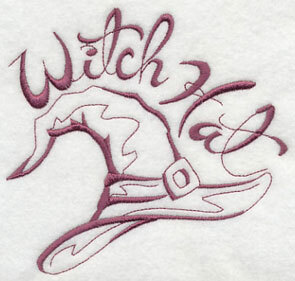 Embroider these designs onto door hangers to welcome the little witches and wizards to your home! 9.41" x 5.61" and 7.81" x 4.66"
9.41" x 5.68" and 7.81" x 4.72"
6.80" x 4.11" and 3.86" x 2.31"
A black cat poses against a full moon and elegant filigree swirls. 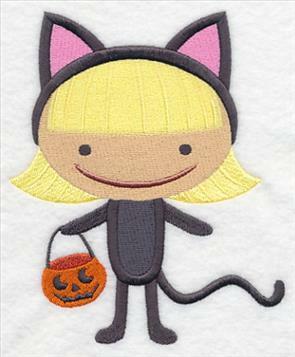 A feline-fashionable look on sweatshirts, jacket backs, and trick-or-treat tote bags! 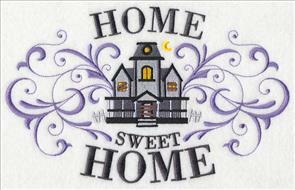 9.41" x 5.64" and 7.81" x 4.69"
6.84" x 4.02" and 3.86" x 2.28"
For ghosts, goblins, and ghouls, a haunted house is a home-sweet-home. 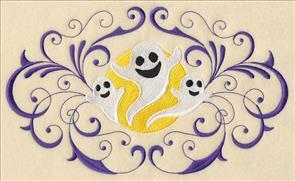 Add this design to mini quilts or banners, and decorate your front door for Halloween! 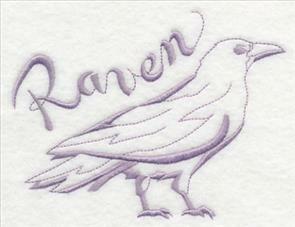 9.34" x 5.87" and 7.81" x 4.91"
6.85" x 4.02" and 3.86" x 2.25"
Add this design to a sweatshirt and presto! 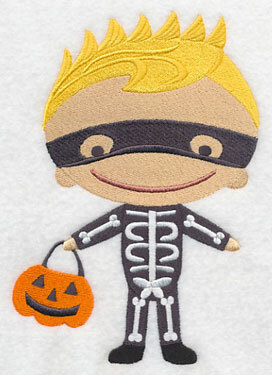 You have a colorful "costume" for handing out candy and treats on Halloween. 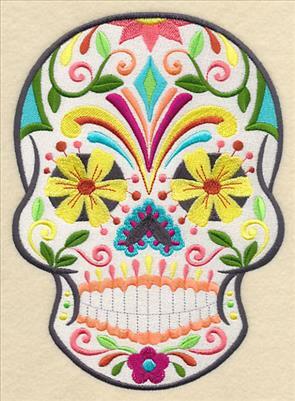 6.85" x 4.08" and 3.86" x 2.34"
Sugar skulls, or calaveras, are traditional pieces of art used to celebrate Dia de Los Muertos, or Day of the Dead. The bright colors are eye-catching additions to totes and pillow covers! 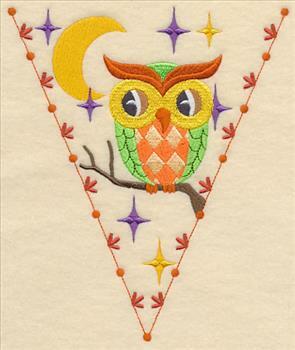 5.88" x 8.08" and 4.87" x 6.70" and 2.83" x 3.88"
Vintage, or light-stitching versions, are lively additions to smooth fabrics. 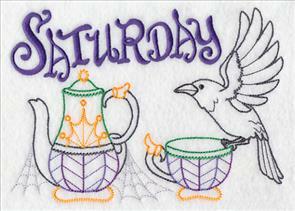 Add them to tea towels and placemats for seasonal celebrations. 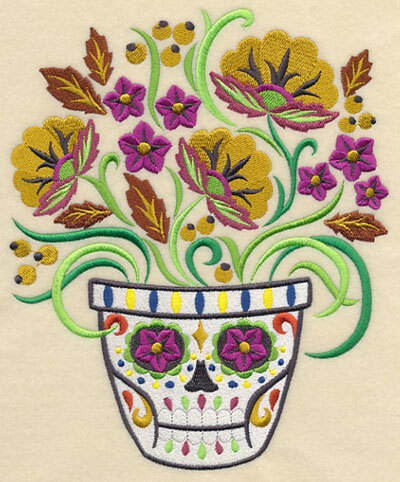 5.81" x 8.04" and 4.90" x 6.76" and 2.81" x 3.88"
Creepy, spooky flowers bloom and grow from a sugar skull planter. 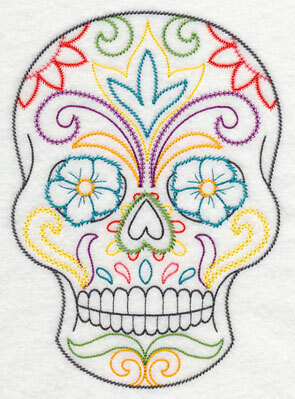 This design is a colorful addition to pillow covers, tote bags, and aprons. 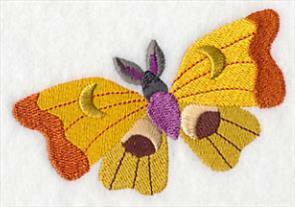 We stitched the flowers and leaves in dark gold, purple, and brown. 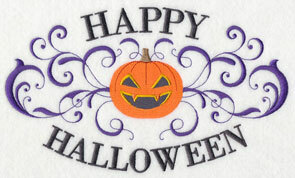 Experiment with different color combinations to match your Halloween decor! 6.89" x 8.32" and 6.45" x 7.79" and 5.86" x 7.08" and 4.86" x 5.87"
Quick-stitching "redwork" medleys are fast and fun ways to dress up dish towels and quilt blocks. 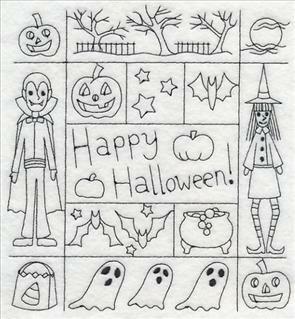 Halloween greetings are in the center, and surrounded by classic imagery: ghosts, jack-o-lanterns, bats, spiders, cats, and more. 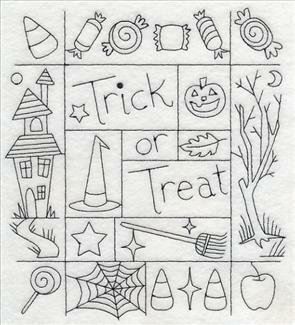 6.90" x 7.67" and 5.85" x 6.50" and 4.85" x 5.39"
Skeletons, spiders, candy, and coffins add a traditional look to these Halloween medleys. 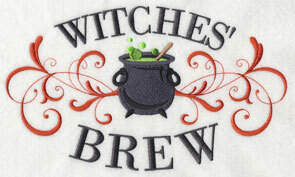 They are light stitching (redwork), so embroider onto smooth, neutral fabrics. 6.90" x 7.64" and 5.85" x 6.48" and 4.85" x 5.37"
These medleys are colorful and contemporary. 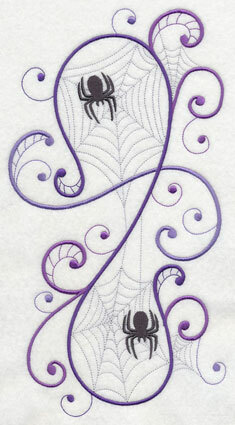 They'll add a creepy-crawly look to towels and totes. Classic Halloween imagery is arranged together. 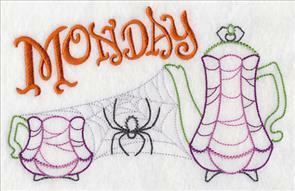 The designs are open and airy, so they're fast additions to your Halloween projects. 6.90" x 9.72" and 5.56" x 7.83"
6.89" x 8.74" and 5.82" x 7.38" and 4.86" x 6.16"
If you prefer, the designs in the medleys above are available individually. Use them separately, or in conjunction with the designs above. 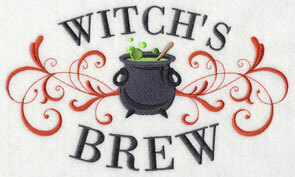 They use one color thread, so they're fast additions to smooth fabrics: tea towels, quilt blocks, linen napkins. 4.51" x 3.56" and 3.61" x 2.85"
2.26" x 5.00" and 1.75" x 3.85"
4.47" x 4.75" and 3.63" x 3.85"
4.14" x 5.00" and 3.19" x 3.85"
5.12" x 3.75" and 3.85" x 2.82"
4.26" x 5.20" and 3.15" x 3.85"
Light up Halloween night with tea light wraps! 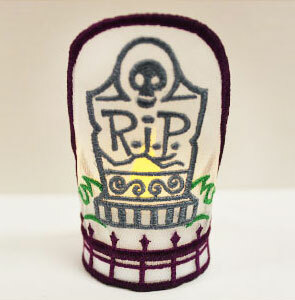 Each tea light wrap features a classic image from fright night. 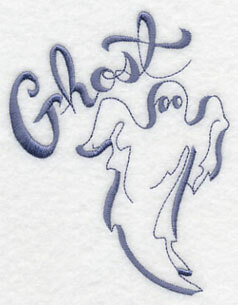 The project instructions demonstrate how to embroider onto organza with water-soluble stabilizer. That's how the light shines through! Fully detailed project instructions are shown here. 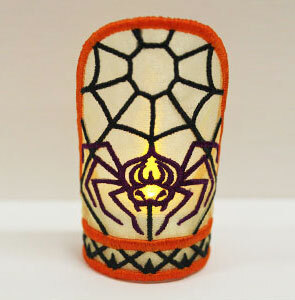 4.72" x 3.12" and 3.84" x 3.14"
The standard size of battery-operated tea lights is 1 1/2 inches in diameter, but these wraps can be adjusted (with elastic) to accommodate variations in size. We've found tea lights at Michaels, Target, and Amazon. And, sometimes you can find them at dollar discount stores, too! 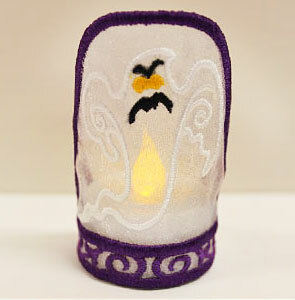 These designs are for battery-operated tea lights - not wax candles. 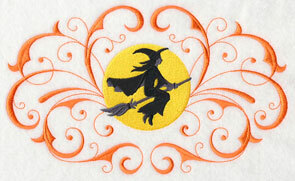 The classic Halloween images on these designs will give your home a spooky glow. Pick one, two, or more single designs using the links above. 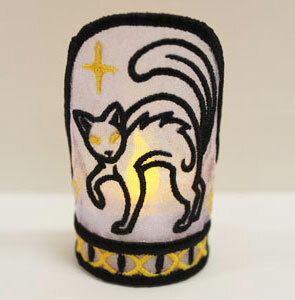 Or, get all of the tea light wraps in a design pack! These project instructions demonstrate how to the wraps right in the hoop. Enjoy this creepy-creative project! 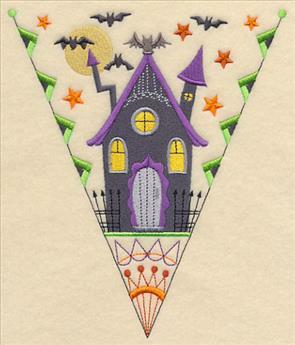 Add a festive look to your home on Halloween with bunting! Embroidered triangles are strung together for a classic and crafty look. Project instructions show how it's done. 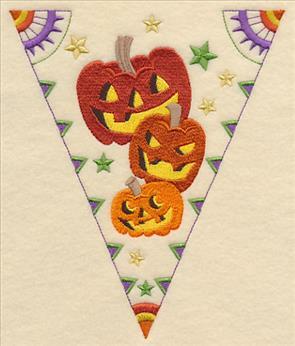 After making bunting for Halloween, branch out into other occasions, too! Other design themes include crafty, floral, and Christmas bunting. 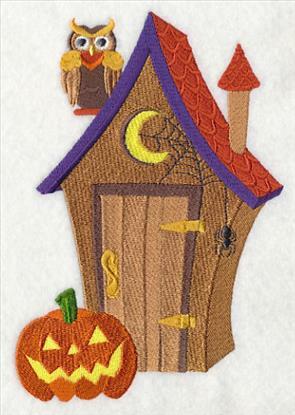 5.81" x 6.94" and 4.81" x 5.74" and 3.25" x 3.87"
A haunted house is a classic image for Halloween bunting. And, a not-so-spooky owl poses under a crescent moon. 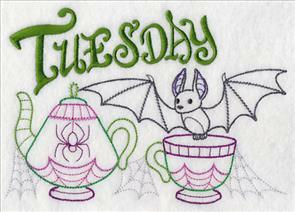 We stitched the samples in a jaunty retro palette. Experiment with other color palettes to suit your creative spirit! 5.86" x 6.94" and 4.86" x 5.76" and 3.27" x 3.87"
The "official" shirt designs are hot topics, and we've received some very creative requests for more. 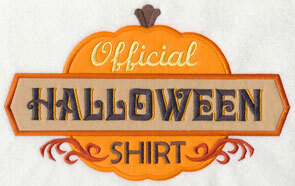 So far we've made Christmas, Chanukah, Thanksgiving, and bowling themes....and this week the theme is Halloween! 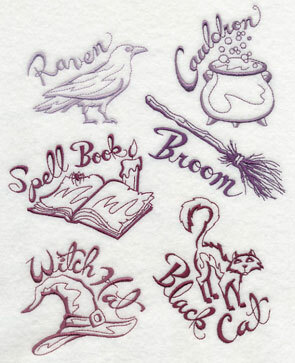 Stitch these designs onto sweatshirts for an instant costume! 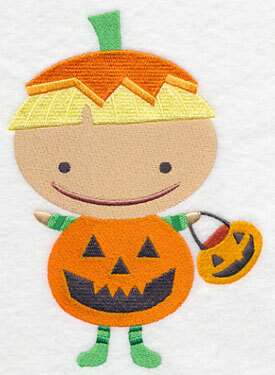 Both stitch-filled and applique versions are available, shown below. 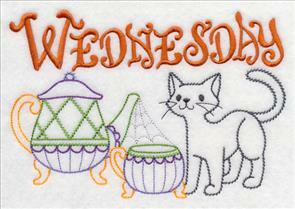 The "request of the week" program is a popular one and we're booked up through 2015 and a bit beyond. The queue is filled to the brim with creative ideas - but we're always happy to have more. 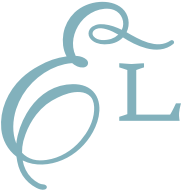 Send your design ideas to us: support@emblibrary.com. 11.00" x 6.82" and 9.40" x 5.83"
7.80" x 4.84" and 6.80" x 4.22"
7.80" x 4.83" and 6.81" x 4.22"
11.00" x 4.76" and 9.40" x 4.07"
7.80" x 3.38" and 6.80" x 2.95"
11.00" x 4.78" and 9.40" x 4.09"
7.80" x 3.40" and 6.81" x 2.97"